Comprehensive review of True Natural Tropical Self Tan. See what real experts and actual users have to say about this self tanning product. Overall, I was very underwhelmed by True Natural Tropical Tan. I ended up giving it 2 out of 5 stars, because there are only two things I like about this product. The good things about this self tanner are the smell (before you apply it, it smells so tropical and yummy! ), and the easy application process. I really don’t like the orange color it produces, and the drying time is really bad. I don’t feel like it ever completely dried because I was sticky all night…and I HATE that sticky feeling. Unfortunately, the good smell faded away after applying it, and I was left smelling like DHA mixed with alcohol. So overall, I wasn’t impressed with this self tanner, so I gave it 2 stars. 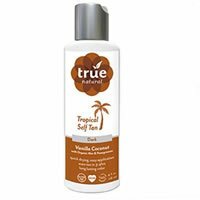 True Natural Tropical Tan is a thick, white cream. It comes out a bit pasty, and it doesn’t have any guide in it. The texture is thicker and creamier than most self tanners. This one takes a while to blend in due to its thick, creamy texture. My body looked entirely white for a few minutes until the product completely blended in. It’s not necessary to wear a tanning mitt while applying this one because the product is white. But make sure you wash your hands immediately after to avoid orange palms. Besides taking a while to blend in, this one is very easy to apply and definitely one of the cleaner applications when it comes to self tanners. This cream took a LONG time to dry. I waited over 40 minutes to put my clothes on, and when I did, I still felt sticky. So, I’m not sure if this one ever completely dried. When I woke up in the middle of the night I felt sticky and wet; it was really gross feeling. Before applying this one, it smells SO good. The bad news is that the alcohol I was smelling became very strong after I applied it (and it didn’t smell good anymore). I tried True Natural Tropical Self Tan in the “dark” shade. I was looking forward to being a deep bronze color, but I ended up with an orange, medium shade tan. My tan was pretty splotchy and it was very orange looking. It wasn’t as dark as I’d like it to be either. It was more of a medium shade. There were a lot of uneven spots on my legs, and I wasn’t a fan of how my tan looked. A lot of self tanners nowadays do a good job or not producing an orange color, but this isn’t one of them. This one lasted about 3 days, and as it faded it looked really bad. I had splotches everywhere, and some areas faded faster than others. So areas of my arms were completely white whereas others were still tan. I looked like I had obviously used a self tanner, and it didn’t look natural at all. No, I think the color is too orange, and it fades really badly! $6.25 an ounce isn’t a bad price, but I wouldn’t pay it again for this product. I’ll happily pay $25 a pop for a good self tanner, but this color was way too orange for my liking. To buy True Natural Tropical Tan, Click Here. Look and Feel This is thick, white cream. Application Applying it is easy, but it takes a few minutes to blend into your skin. Drying Time I felt sticky all night, it took over 40 minutes to dry. Smell (Before) It smells like a yummy pina colada. Smell (After) After applying the smell turned into DHA and alcohol…yuck. Color Produced I got a medium shade tan that was very orange and uneven. How Long It Lasts It lasted about 3 days and then faded very splotchy. OK For Men? Nope, I don’t think men will like this one. Price It’s $6.25 per ounce, so just a tad more than average.